PAUL MASEYK HAS A SHOW ON AT EVAN HUGHES GALLERY IN SYDNEY AT THE MOMENT. CHECK OUT HIS CERAMICS, GREAT WORK. 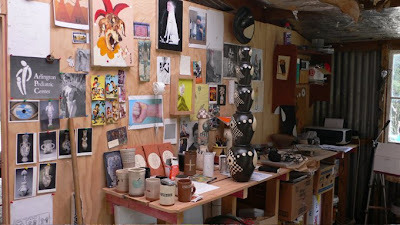 THE IMAGE BELOW, WHICH IS FEATURED ON THE WEBSITE'S HOMEPAGE IS OF PAUL'S COROMANDEL STUDIO WHERE HE'S BEEN LIVING SINCE ARRIVING BACK FROM THE ARCHIE BRAY FOUNDATION RESIDENCY IN HELENA, MONTANA. ON THE WALL (IN THE PHOTO) IS A PAINTING OF MINE FROM 1999 OF AN H.M.V. DOG WITH GORDON WALTERS HEAD, PLUS A MIRRORED PHOTO OF ME HOLDING THE PAINTING IN QUESTION TO THE RIGHT OF THE PAINTING. IT'S INTERESTING LOOKING AT ARTIST STUDIO WALLS AND SEEING WHAT CONSCIOUSLY AND SUB-CONSCIOUSLY INFLUENCES THEM. THERE ARE SEVERAL SYMBOLS IN THIS PHOTO THAT I'VE SEEN APPEAR IN PAUL'S WORK OVER THE LAST COUPLE OF YEARS.